Uh-oh. Kitty's going in and out of the litter box, straining to pee. You know that's not normal. If his urethra is blocked, that's a red alert and means a trip to the vet's office pronto. He probably has some form of lower urinary tract disease, which can include crystals. 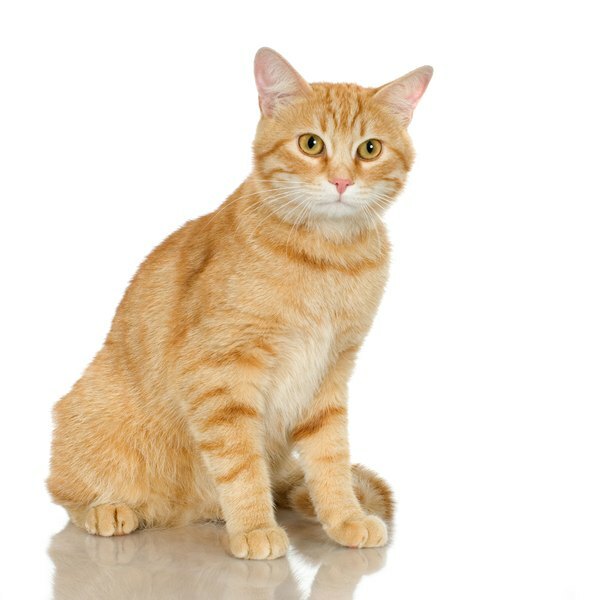 Previously referred to as feline urological syndrome, feline lower urinary tract disease refers to any ailments affecting the cat's bladder or urethra. While that includes bladder infections such as cystitis, FLUTD also encompasses urethral blockages caused by crystals. Because male cats have narrower urethras than females, they're more prone to blockages. Besides the frequent, unproductive trips to the litter box, your kitty may cry out in pain, constantly lick his nether regions or produce bloody urine. Even if he does pee out small amounts of normal urine, take him to the vet as soon as possible because he could become completely blocked. Risk factors for crystal formation include diet, low water consumption, obesity, viral and bacterial infections, stress and urinary pH level imbalance. Some cats may be genetically predisposed to FLUTD, as Persian, Himalayan and Burmese cats often suffer from it. Your kitty can appear quite healthy and happy until the blockage strikes. If crystals are blocking your cat's urethra, he'll need immediate surgery. As he recuperates, he may need IV fluids to rehydrate him and keep his kidneys in working order. Your vet might recommend specific diets for him, depending on the type of crystal causing the problem. Generally, cats eating canned foods don't form crystals as frequently as those on dry food diets. The type of diet your vet recommends depends on the type of crystals blocking your cat. Struvite crystals form because of high levels of magnesium phosphate, so your vet will recommend a low magnesium diet that acidifies urine. Calcium oxate crystals require a diet producing more alkaline urine.